Since the midseason premiere of Agents of S.H.I.E.L.D., the series has focused on the impact the revelation of Inhumans has had on the political machinations of various countries around the world - with Director Coulson (Clark Gregg) and his team of humans and Inhumans alike attempting to manipulate those machinations as the covert spy organization that S.H.I.E.L.D. is again. Meanwhile, Grant Ward (Brett Dalton) is now inhabited by Hive, an ancient Inhuman brought back from the alien planet Maveth, and is gathering strength as he becomes the new leader of Hydra. This week's episode, 'Parting Shot' written by Paul Zbyszewski and directed by Micahel Zinberg, takes a vacation from outside storylines to focus on the single mission to protect the Russian Prime Minister from a coup organized by Gideon Malick (Powers Boothe). Bobbi (Adrianne Palicki) and Hunter (Nick Blood) take center stage in the episode, which works as both a semi-backdoor pilot for their spinoff series, Marvel's Most Wanted, and an emotional sendoff for these characters. 'Parting Shot' is Marvel TV storytelling at its best (so long as we're looking only at this episode and not at how it fits into the season as a whole). The episode weaves exciting action set pieces with emotional character development and humor tailor-made to each cast members' strengths, all built within the confines of a focused spy mission to prevent an Inhuman assassin from killing the leader of Russia without anyone knowing about S.H.I.E.L.D. 's presence at all. 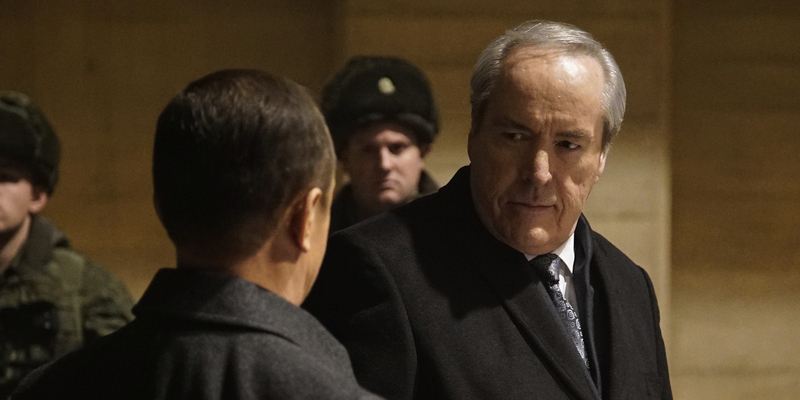 The fact that the assassin is an Inhuman politician - Russia's Minister of Defense - is incidental within the construct of a fairly run-of-the-mill spy storyline, but it gives 'Parting Shot' the element it needs to elevate Agents of S.H.I.E.L.D. from a simple spy show to one with comic book influences. The Inhuman himself, General Androvich (Kirstof Konrad), isn't given much pomp or explanation in 'Parting Shot', with the team receiving a best guess from Simmons (Elizabeth Henstridge) that he's able to generate a "sentient dark force" that can operate independently to him and become corporeal or non-corporeal at will. (Though this could be an allusion to season 2 of Agent Carter dealing with Zero Matter, the episode does not offer any confirmation of there being a connection.) However, Zinberg uses General Androvich's ability to create an exciting and visually interesting fight sequence between the Dark Force Inhuman, Bobbi, and Daisy (Chloe Bennet). Additionally, the formatting of the episode, flashing forward and back between Bobbi and Hunter's interrogations and the mission that got the two arrested, helps to add an interesting foreshadowing element to the episode that 'Parting Shot' wouldn't have been able to achieve with a linear storyline. Flashbacks or flashforwards, when used sparingly, can increase the drama and tension of an episode, which is much the case of 'Parting Shot' - though Hunter listing his recipe for mushroom soup also adds a hint of humor viewers have come to expect from his character. These elements come together to craft a fun and compelling episode in 'Parting Shot', even if it doesn't necessarily fit into the overarching tone or storyline of the season. Since the midseason premiere, both Bobbi and Hunter had largely been relegated to supporting characters, providing humor and action in equal parts, but still leaving much of the heavy lifting of to their fellow S.H.I.E.L.D. agents - with the exception of Hunter's distrust of Carl Creel (Brian Patrick Wade) in 'The Inside Man'. As such, their sudden thrust to the forefront in 'Parting Shot' gives the episode a too-obvious tone of sendoff from the very beginning, one that would feel out of place within the season to those viewers who hadn't heard about Marvel's Most Wanted (and, perhaps, even to many who were aware of the spinoff). That being said, Zbyszewski - who co-created Marvel's Most Wanted along with fellow Agents of S.H.I.E.L.D. producer Jeffrey Bell - makes a valiant effort in giving Bobbi and Hunter the sendoff their characters deserve as well as setting up the plot for Most Wanted, and he is largely successful in doing so. The theme of a vacation, and the fact that Bobbi and Hunter have never taken one together because of their jobs, is established early on and acts as a throughline for the episode. The relationship of Bobbi and Hunter acts as the emotional core of 'Parting Shot', carrying them through the mission to prevent the Prime Minister's assassination and their subsequent interrogations, with this theme laid bare when their interrogator states, "Your weakness is each other." However, Bobbi and Hunter's relationships with fellow characters also come to the forefront of 'Parting Shot'. Hunter apologizes to May (Ming-Na Wen) for his actions earlier in the season when he was seeking revenge on Ward, continuing a theme of sacrifice that is paid off in the final act when Hunter and Bobbi decide to sacrifice their lives as spies in order to maintain S.H.I.E.L.D. 's cover in the operation to save the Russian Prime Minister. Additionally, Bobbi is able to shine alongside Daisy in the battle against General Androvich's Dark Force being, giving viewers the cool visual of the two standing back to back preparing to fight. It all leads to the culminating scene of Bobbi and Hunter sitting in a bar, receiving parting shots of liquor from their friends - hiding amongst the other patrons - as they each say their goodbyes from a distance. The emotional poignancy of this scene is almost enough to forgive the rushed storytelling in ushering Bobbi and Hunter out the door to their own show. But, all the teary farewells from Mack (Henry Simmons) can't save 'Parting Shot' from the murky in-between area of being not really a backdoor pilot and not really a cohesive episode in Agents of S.H.I.E.L.D. season 3. Share your thoughts on the episode and theories about what's to come in the next episode in the comments below!